Subscribers pay the same $15 a year subscription rate but have access to more than 165 articles from back issues as well as current issues. 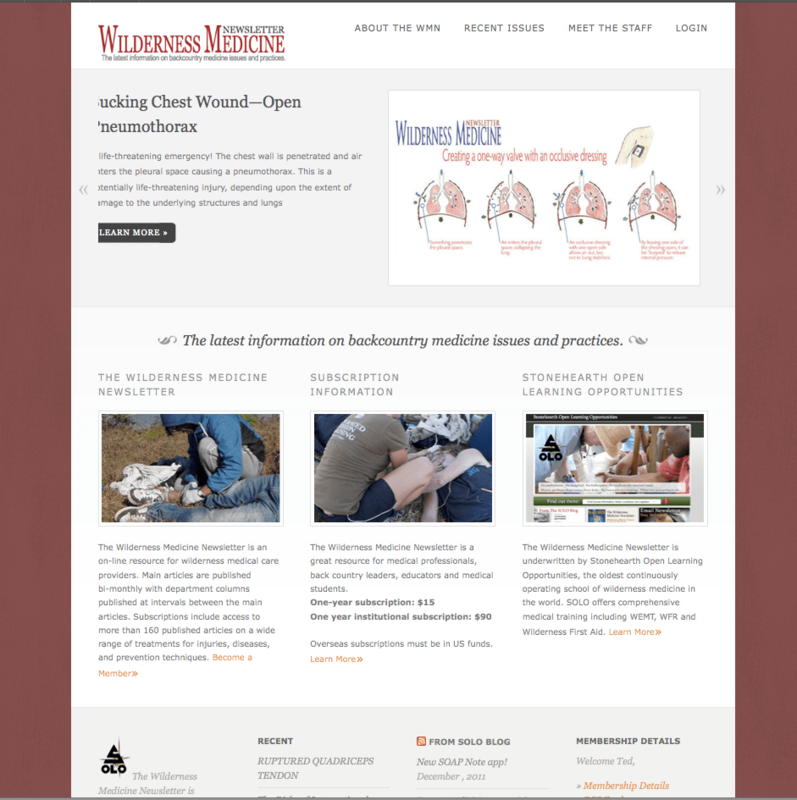 You can search the site either by category, or by key words making the Wilderness Medicine Newsletter site a much more useful reference for everything from reviewing splinting to the prevention and treatment of tropical diseases. May be obvious = dented, depressed, open. The skull is thick in front, top, back, and thin on the sides. The most dangerous are temporal area fractures, because the middle meningeal artery may be severed causing bleeding into the skull. There can be dramatic superficial swelling = hematoma, usually harmless. May have “Battle’s sign” (ecchymosis behind & below the ears), which indicates basal skull fracture, very dangerous. The severity of the injury is deteremined by the level of consciousness. The danger is bleeding/swelling inside the cranium that can cause increasing ICP. They become irritable, angry as their LOC decreases down the AVPU scale. Respiration rate and depth will increase, hyperventilation. Heart Rate will slow, bradycardia, as the systolic blood pressure increases. Blood Pressure: The systolic blood pressure will increase faster than the diastolic causing a widening of the pulse pressure (systolic – diastolic pressures). Vomiting can occur as the ICP increases. In severe head injuries cerebrospinal fluid (CSF) may leak out of the nose, ears, or wounds. Evacuate at first signs of increasing ICP. Cover wounds with dressings, being careful not to depress fragments. Examine spine carefully for possible injury associated with the head trauma. Orbit injuries – check for “Blowout fx”, one eye cannot look up. “Le Fort fxs” of the face will have a loose hard palate or maxilla. Fractured nose, may bleed, easy to control, cosmetic injury. Monitor for runny nose that will not stop, can indicate leaking CSF. Fractured jaw, teeth will not fit properly, cannot easily open/close, check TMJs. Avulsed teeth, replace into socket or transport in patient’s own spit. Greatest concern with facial injuries is the airway. This blog is powered by the Wilderness Medicine Newsletter, now celebrating 20 years of publication. The WMN is published and distributed online six times each year by TMC Books, and subscriptions cost as little as $10 per year. To find out more, or to subscribe online, click here.